Last night I witnessed a car hit a jogger on my way home from work. I was driving along the beautiful waterfront of our City. It was about 6:30 and it was still bright and clear with a bit of a chill in the air. There was a lot of traffic on the road because the area was under construction. Likewise, there were many pedestrians enjoying the waterfront after their busy work days. As I approach an intersection, I see a car turn right and smash into a jogger as she ran across a cross-walk. Thankfully, while the pedestrian appeared to injure her wrist, she did not suffer severe injuries. She was up and walking around but in obvious pain. I called 911. The professionalism and efficiency of the 911 operator impressed me. Within no time, she dispatched paramedics and the police. Kudos to our local 911 operators for all that they do for us. As I reflect on what happened, it was an entirely preventable collision. I didn’t see who had the right of way as I was too far away from the intersection. At the same time, someone was at fault. Either the driver wasn’t paying attention for oncoming pedestrians as she turned right or the pedestrian was running across the road against a “don’t walk” signal. Perhaps there was a level of shared responsibility. Does it matter who was at fault at this point? While it would matter in any legal dispute that followed this incident, I bet the driver and the jogger would have done things differently if you asked them today. The driver would have spent an extra second looking to her right before beginning her turn. The jogger would have paused before entering the pedestrian cross-walk taking note of the oncoming car. No matter who was at fault however, the driver or the jogger could have prevented the collision. And this is the situation in many (but not all) of my clients’ cases: they were entirely preventable by one or both of the involved parties. What’s the lesson from this? 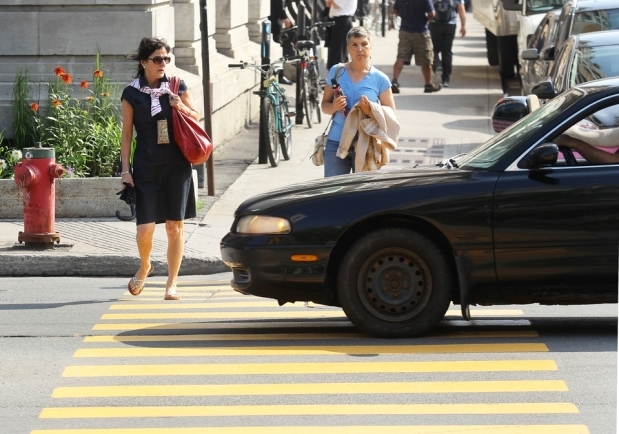 Drivers and pedestrians be more attentive as the weather changes. That same route you travel home each night takes on a different complexion in the summer. The intersection where you rarely see a pedestrian in the cold of the winter can be a hub of activity when the warmer weather hits. Likewise, compared to the treadmill you use in the winter, the roadway has many obstacles for runners and pedestrians alike. An extra second of attentiveness can save you from having to see a lawyer like me, it can save you the pain of an injury, the years of rehab, the endless battles with your car insurance company about whether it will fund your treatment or the guilt of knowing that you seriously injured another person. Be attentive. And for those who find themselves wondering…no I didn’t give anyone my business card.